LISBON – Christie®, a leader in creating and sharing the world’s best visual and audio experiences, is pleased to announce that the Museu de Arte Popular in Lisbon is using Christie GS series laser projectors in an exhibition featuring outstanding examples of the refurbishment of Portuguese architectural heritage. The goal of the exhibition, “Physics of Portuguese Heritage. Architecture and Memory,” is to demonstrate the level of excellence in Portuguese projects for the refurbishment of its national heritage. The exhibit includes over 300 photographs and 12 scale models of projects involving complex interventions concluded over the span of the last five years in six different locations in Lisbon and Porto. Balaclava Noir, a company specialized in technical consulting in the visual arts, was commissioned with installing Christie equipment in conjunction with Total AV, a supplier of AV solutions and a Christie partner in Portugal. 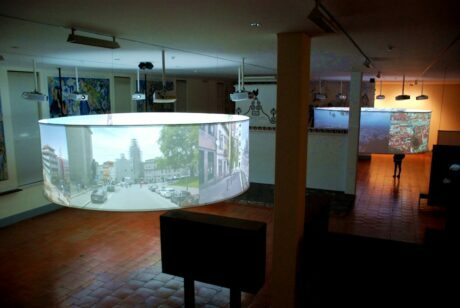 The exhibition uses 12 Christie DWU635-GS laser projectors with 1DLP technology, WUXGA resolution and 6750 lumens to power two cylindrical screens with a diameter of 6.2 meters. Through the use of cylindrical screens, the exhibition curators wanted to avoid the conventional form of visualising contents in order to create a more versatile and enveloping space, and thus ensure a truly immersive experience for visitors. “The usual problem with cylindrical screens is the tendency for some points to have more light than others, but the Christie software allowed us to reduce them drastically in terms of brightness and also color,” explained Luis Carmo, accounts manager at Total AV. For João Chaves, from Balaclava Noir, “the Christie projectors have proved themselves to be the best in their class. Their versatility makes them perfect for all kinds of events.” he concluded. 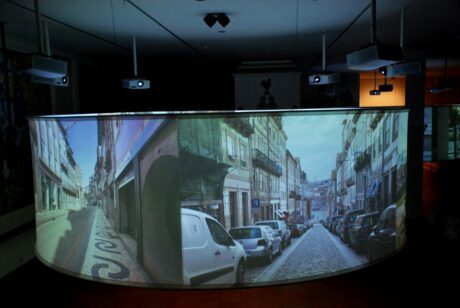 The Christie DWU635-GS projectors used in the exhibition have built-in warping and blending functions, dynamic contrast, 360-degree orientation and portrait and landscape modes. With 20,000 hours of maintenance-free functioning and 24/7 operation, they also include Christie RealBlack™ technology, which guarantees a 4,000,000:1 full on/off contrast ratio in an ultra-silent solution (36dBA). The exhibition remains on view to the public through March 6, 2019.